ZIMBABWE – Controversial South African politician Julius Malema says President Robert Mugabe is an “opportunist” who waited until he was losing power to implement land reform and South Africa under him would never follow the 91-year old’s method. The Economic Freedom Fighters (EFF) leader was addressing students at the University of Oxford Wednesday. He said the EFF would continue the fight for the return of land to black Africans and the equitable sharing of South Africa’s mineral wealth. However, he said Mugabe’s bloody land grab method, which saw thousands of white farmers and their black workers violently driven out of their properties, was not exemplary. “We are not going to do what the Zimbabweans have done; of drawing the blood of innocent people. There’s nothing wrong with Mugabe’s policy on land, but there’s everything wrong with the method used to obtain the land. We cannot have people killed, injured because you want your land back. “Mugabe had more than 25 years to pass legislation through democratic means that would systematically take the land back, he did not do anything about it. He only introduced that policy at a time when he was losing power, it was opportunistic. 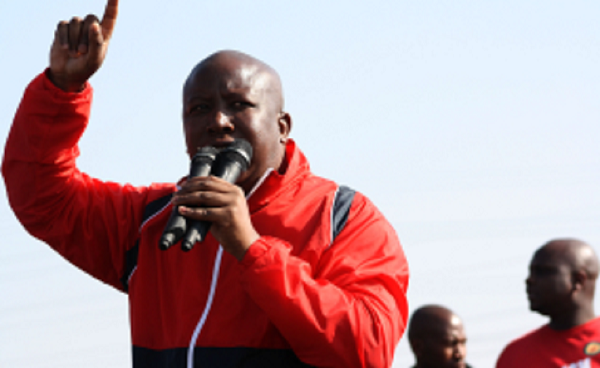 Malema’s comments come at a time when Harare sees him as a close ally. Mugabe’s loyalists like former indigenisation and current local government minister Saviour Kasukuwere see Malema as a personal comrade. During Malema’s last visit to Zimbabwe, a few years ago, he expressed his support for Mugabe and was shown wearing a Zanu PF shirt emblazoned with Mugabe’s image. At Oxford, the EFF leader also fell sWith Agencieshort of describing first SA black president Nelson Mandela as a “sell-out” who was unable to complete the revolution because he was “too old” and “tired”. “The deviation from the Freedom Charter was the beginning of selling out of the revolution. When Mandela returned from prison he got separated from Winnie Mandela and went to stay in a house of a rich white man, he was looked after by the Oppenheimers, Mandela used to attend those club meetings of those white men who owned the South African economy. “He stayed in one of their houses, they had access to him 24hours. They told him what he represented would not be achieved, that’s when he turned against himself. “The Nelson we celebrate now is a stage-managed Mandela who compromised the principles of the revolution, which are captured in the Freedom Charter. “The Freedom Charter is the Bible of the South African revolution. Any deviation from that is a sell-out position. We normally don’t use phrases like Mandela sold out, he was too old, he was tired, he left it to us. For billionaires Patrice Motsepe and Cyril Ramaphosa (SA Vice President) Malema had utter contempt. The two, he said, “sold their black skin” to become rich. He said despite Motsepe and Ramaphosa being billionaires they had “not invented anything, unlike that young man who invented Facebook”.